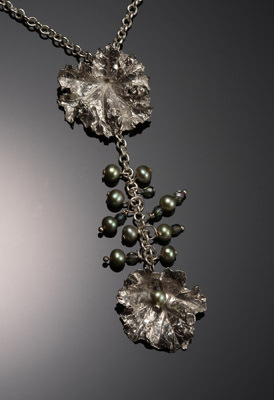 Patricia Jackson creates original, unique pieces of jewelry often inspired by nature and natural objects, some rather fanciful. These pieces are made from Precious Metal Clay (PMC®, .999 fine silver) with Sterling Silver (.925) chains and findings, and may include gold accents, semiprecious stones, cubic zirconia, dichroic glass, crystal and other materials. She is a member of the PMC Guild, Inc. and has taught classes in the use of PMC at 171 Cedar Arts Center in Corning, NY for several years. Her jewelry is available at Gustins Gallery Goldsmiths in Corning, NY.